SSC JE Recruitment 2019: Staff Selection Commission (SSC) has begun the online application process for Junior Engineer (Civil, Electrical, Mechanical, and Quantity Surveying and Contract) Examination 2018. The posts are Group B (Non-Gazetted), in Level- 6 (Rs. 35400-112400/-) of pay matrix of 7th Central Pay Commission. The number of vacancies has not been released yet and will be announced in due course of time. 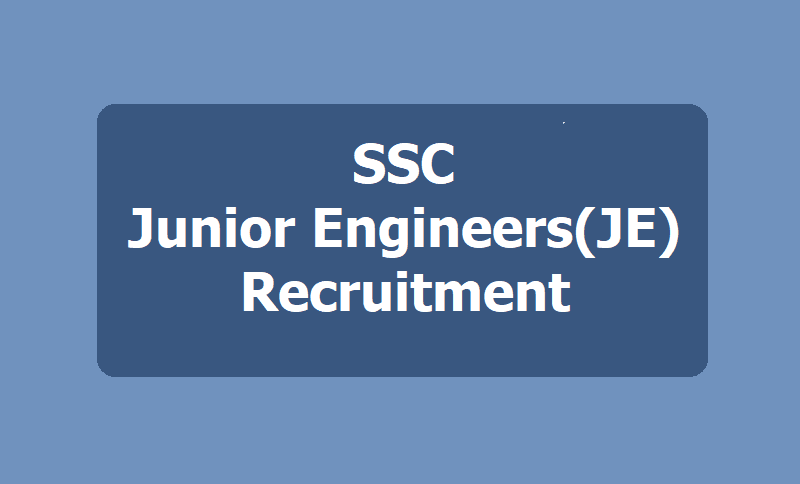 SSC Junior Engineers(JE) Recruitment 2019, Vacancy Details: The Staff Selection Commission has released the vacancy details for the ongoing SSC JE recruitment. According to a statement posted on the Staff Selection Commission (SSC) website, the Commission will be recruiting a total of 1,627 posts through the JE recruitment its online application process began in the first week of February. The SSC will be hiring Junior Engineers in Civil, Electrical, Mechanical, and Quantity Surveying and Contract trades through the recruitment process. The posts are Group B (Non-Gazetted), in Level- 6 (Rs. 35400-112400/-) of pay matrix of 7th Central Pay Commission. Out of the total vacancies announced today, 1,313 Junior Engineers will be recruited to the Civil Engineering cadre while rest of the vacancies will be distributed among other posts. The SSC JE recruitment registration process will be held till February 27. The Computer-Based Test for paper 1 will be held in September, according to the official notification. The SSC JE recruitment notification released in January became the first major recruitment by a Central Government agency carrying the reservation benefits for recently announced 10 per cent quota for Economically Weaker Sections (EWS) from the general category. "Reservation for Scheduled Caste (SC)/ Scheduled Tribe (ST)/ Other Backward Classes (OBC)/ Economically Weaker Sections (EWS) and Persons with Disability (PwD) etc would be as determined and communicated by the Indenting Ministries/ Departments/ Offices, as per extant Government Orders," said the Staff Selection Commission (SSC) Junior Engineer (JE) notification. The Staff Selection Commission, SSC has issued a notification for junior engineers (civil, mechanical, electrical and quantity surveying and contract) recruitment examination 2019 on its official website. The application process for the examination will continue until February 25, 2019. Candidates should opt only for posts for which they have the qualification and are within the prescribed age limits. As Junior Engineer is a Group B post, there is no reservation for ex-Servicemen category. However, benefit of age-relaxation will be admissible to ex-Servicemen candidates, as per extant Govt. Orders. Candidates should check the eligibility and other details carefully before applying for a certain post.